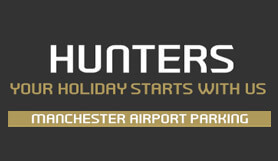 An Independent, friendly, highly experienced family run car storage company, only minutes from Manchester Airport. formerly Shentons airport parking. Free courtesy drop off and collection service to all 3 terminals. Dedicated parking facility with Park Mark Security Award, monitored CCTV and floodlighting. This car park is manned 24/7 and CCTV is in operation. It is recommended that you arrive at the car park at least 30 minutes before your check in desk opens. Vehicles larger than 4x4 can be parked but there will be a supplement of £15 payable to the car park on arrival. This includes; minibuses, vans, camper vans. Motor homes can be discussed with the car park directly prior to booking. If you have more than 5 passengers you will also be charged a surcharge of £10.00 per person payable to the car park. On arrival at the car park, check in at reception, with your return flight details, booking voucher and CAR KEY ONLY. Once booked in you will be given a card detailing designated pick up points and contact information for your return. Board the free courtesy bus to the airport which drops off and collects from all 3 terminals. Once you have collected your luggage and cleared through customs, please phone the number given at check-in and follow directions to where the bus will collect you from outside the terminal. Leave the M60 at Junction 3, signposted Cheadle, Wilmslow, Congleton. Go through the traffic lights, then take the 2nd left signposted Manchester Airport, Heald Green, B5358. At the top of the slip road turn right and take the third exit, then at the next roundabout take the 2nd exit (Heald Green). Go straight on at the traffic lights and continue along Wilmslow Road. Just after a right-hand bend, turn immediately left into Hunters/7 Ways. Leave the M56 at Junction 5 and follow the signs for T1 & T3 until joining the A555. Leave at the junction for Heald Green B5358 and at the roundabout take the first exit. Carry on 0.4 miles turning right immediately after Southgate Offices into Hunters.